In the late 1960s a ‘crisis’ erupted in social psychology, with many social psychologists highly critical of the ‘old paradigm’, laboratory-experimental approach. Originally published in 1989 The Crisis in Modern Social Psychology was the first book to provide a clear account of the complex body of work that is critical of traditional social psychological approaches. 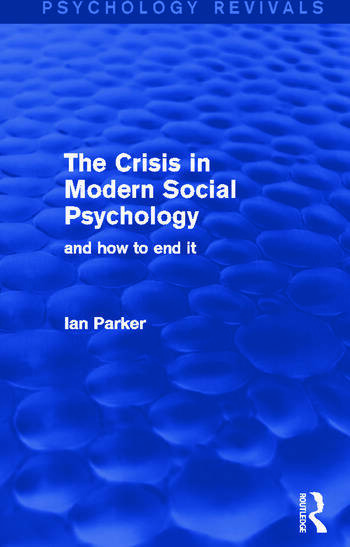 Ian Parker insisted that the ‘crisis’ was not over, showing how attempts to improve social psychology had failed, and explaining why we need instead a political understanding of social interaction which links research with change. Modern social psychology reflects the impact of structuralist and post-structuralist conceptual crises in other academic disciplines, and Parker describes the work of Foucault and Derrida sympathetically and lucidly, making these important debates accessible to the student and discussing their influence. He assesses the responses from both mainstream social psychology and from avant-garde textual social psychology to the influx of these radical ideas, and discusses the promises and pitfalls of a post-modern view of social action.